Strollers are one of those things that are really based on personal preference, and it seems like everyone has the kind they like the best. In my case, I have several I like. 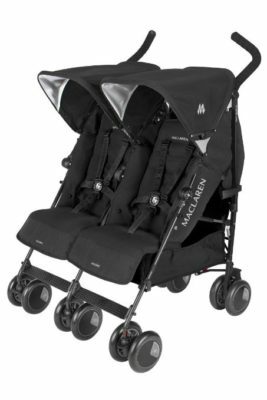 I have a jogging stroller for running and other outdoor activities, but the Maclaren Twin Techno has always been my go-to stroller for everything else. I bought one when my girls were born, and they used it until my boys were born, and then they used for three more years. It held up beautifully, and we put it through a lot! They’re actually for newborns too, so they serve a wide age range. I’m all about side-by-side strollers for twins–no fighting over who gets the front or back! Plus, they’re easier to steer! I was actually surprised at how small it does fold up–it’s not tiny, because it’s still a double stroller, but it doesn’t take up tons of room either.